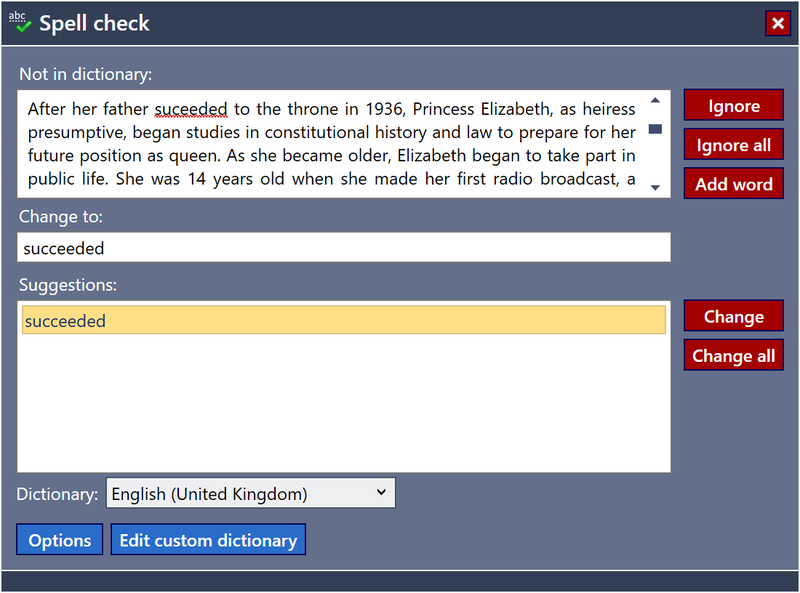 Spell Check allows you to detect and correct spelling mistakes in the information recorded in your family tree. Spelling mistakes can be automatically detected as you type. Right clicking over a spelling mistake provides options for correcting the mistake. You can choose from a list of suggested words, ignore all instances of the mistake until the next time you start the application add the word to the custom dictionary so it is no longer detected as a mistake. Fig 1. Spell check as you type. You can spell check all text in the file using the global spell check tool. Pressing F7 will automatically load the spell check dialog. Spelling mistakes are displayed in red. Choose a correction from the list of spelling suggestions or type your own correction. Fig 2. The global spell check tool. Ignore: ignores the current misspelt word. Ignore all: ignores this and future occurrences of the misspelt word. 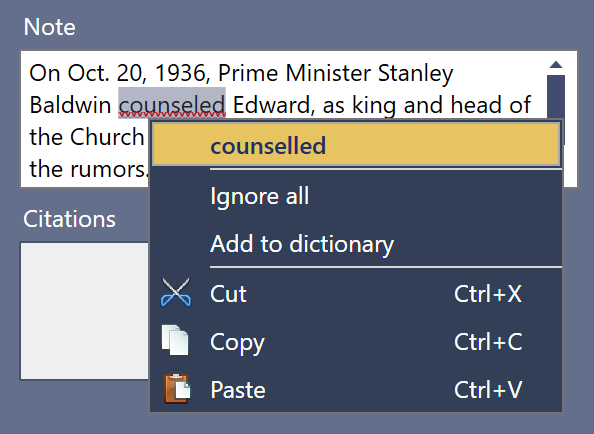 Add word: adds the current misspelt word to the custom dictionary. It will no longer be detected as a spelling mistake. Change: corrects the misspelt word using the text in the Change to box. Change all: corrects all future occurrences the misspelt word using the text in the Change to box. Dictionary: the language of the spell checking dictionary. By default, My Family Tree supports all major versions of English, French, German and Spanish. Additional dictionaries are available if additional languages have been added on Windows 8.1 or later. The languages which can be spell checked depend on the version of Windows® and the version of the .NET Framework installed on your device. Windows 8.1 Spell checking capabilities are available for languages in the 'Region & language' languages list (see Adding extra languages below). On Windows 8.1 and later simply click "Add a language" in the Region and Language section of the Settings app. Choose your preferred spell check language and wait for the download and installation of the feature to complete. The next time you start My Family Tree, any new languages will be available for use in spell check. Fig 3. Adding a language in Windows 10.